Since 1976 the caring, experienced doctors and staff at Omaha Animal Hospital have offered complete veterinary medicine catered to the specific needs of you and your pet. As a full-service animal hospital located in Omaha, we are dedicated to providing your dog, cat or pocket pet with high-quality, compassionate and modern veterinary medicine. 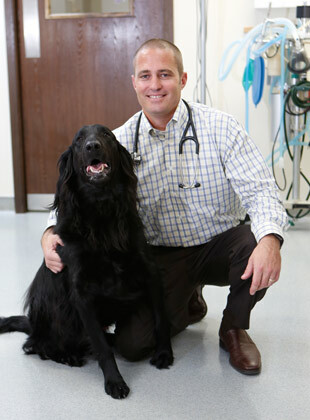 Founded by Dr. Michael Tierney, Omaha Animal Hospital was purchased by Dr. Luke Berglund in 2016. While at his Florida practice, Dr. Berglund served on the Animal Services and Advisory Board for five years and was the Manatee County Animal Services Medical Director and Contract Veterinarian for six years. In purchasing Omaha Animal Hospital, Dr. Berglund and his staff have brought cutting edge veterinary medicine to the surrounding community. We provide services from endoscopy to orthopedic surgeries to wellness checks, to name a few. With our in-house laboratory and digital radiograph systems we provide the best diagnostic services for your pet. Our philosophy is simple: we strive to provide the best possible veterinary care to your pet when they need it most. To that end, we welcome walk-ins or last minute appointments. However, a modern veterinary hospital is more than simply advanced medical technology and the collective skills and experience of its staff. We are pet owners ourselves and understand how important your pet is to your family. We also understand how important it is to you that your pet receives veterinary care from professionals within a friendly, welcoming environment where your questions and opinions are respected. The doctors and staff at our Omaha veterinary practice believe our medical expertise and love for animals are of little use if we do not share them with you. Client education is an important aspect of the work we do and it is part of our mission to improve the human/animal bond and promote responsible pet ownership. When you entrust your treasured companion's well-being to us, we understand and embrace our duty to listen to your concerns and provide you with the latest information on caring for your type and breed of pet.